The first sleep book by a leading scientific expert—Professor Matthew Walker, Director of UC Berkeley’s Sleep and Neuroimaging Lab—reveals his groundbreaking exploration of sleep, explaining how we can harness its transformative power to change our lives for the better. Sleep is one of the most important but least understood aspects of our life, wellness, and longevity. Until very recently, science had no answer to the question of why we sleep, or what good it served, or why we suffer such devastating health consequences when we don't sleep. Compared to the other basic drives in life—eating, drinking, and reproducing—the purpose of sleep remained elusive. An explosion of scientific discoveries in the last twenty years has shed new light on this fundamental aspect of our lives. Now, preeminent neuroscientist and sleep expert Matthew Walker gives us a new understanding of the vital importance of sleep and dreaming. Within the brain, sleep enriches our ability to learn, memorize, and make logical decisions. It recalibrates our emotions, restocks our immune system, fine-tunes our metabolism, and regulates our appetite. Dreaming mollifies painful memories and creates a virtual reality space in which the brain melds past and present knowledge to inspire creativity. Walker answers important questions about sleep: how do caffeine and alcohol affect sleep? What really happens during REM sleep? Why do our sleep patterns change across a lifetime? How do common sleep aids affect us and can they do long-term damage? Charting cutting-edge scientific breakthroughs, and synthesizing decades of research and clinical practice, Walker explains how we can harness sleep to improve learning, mood, and energy levels; regulate hormones; prevent cancer, Alzheimer’s, and diabetes; slow the effects of aging; increase longevity; enhance the education and lifespan of our children, and boost the efficiency, success, and productivity of our businesses. Clear-eyed, fascinating, and accessible, Why We Sleep is a crucial and illuminating book. Matthew Walker is a professor of neuroscience and psychology at UC Berkeley, the Director of its Sleep and Neuroimaging Lab, and a former professor of psychiatry at Harvard University. He has published over 100 scientific studies and has appeared on 60 Minutes, Nova, BBC News, and NPR’s Science Friday. Why We Sleep is his first book. "The director of UC Berkeley's Sleep and Neuroimaging Lab explores the purpose of slumber. Understanding the 'why,' it turns out, just might help you with the 'how to.'" "A neuroscientist has found a revolutionary way of being cleverer, more attractive, slimmer, happier, healthier and of warding off cancer — a good night’s shut-eye ... It’s probably a little too soon to tell you that Why We Sleep saved my life, but I can tell you that it’s been an eye-opener." "This is a stimulating and important book which you should read in the knowledge that the author is, as he puts it, 'in love with everything that sleep is and does.' But please do not begin it just before bedtime." "Fascinating ... Walker describes how our resting habits have changed throughout history; the connection between sleep, chronic disease, and life span; and why the pills and aids we use to sleep longer and deeper are actually making our nights worse. Most important, he gives us simple, actionable ways to get better rest—tonight." 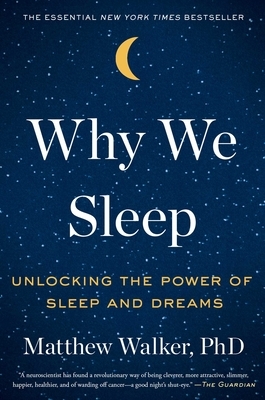 "Why We Sleep is simply a must-read. World-renowned neuroscientist and sleep expert Matthew Walker takes us on a fascinating and indispensable journey into the latest understandings of the science of sleep. And the book goes way beyond satisfying intellectual curiosity, as it explores the cognitive, health, safety and business consequences of compromising the quality and quantity of our sleep; insights that may change the way you live your life. In these super-charged, distracting times it is hard to think of a book that is more important to read than this one." "In Why We Sleep, Dr. Matt Walker brilliantly illuminates the night, explaining how sleep can make us healthier, safer, smarter, and more productive. Clearly and definitively, he provides knowledge and strategies to overcome the life-threatening risks associated with our sleep-deprived society. Our universal need for sleep ensures that every reader will find value in Dr. Walker's insightful counsel."